Neanderthals were a type of early hominid that lived on the planet earth between about 200,000 to 30,000 years ago. Our immediate ancestor, 'Anatomically Modern Human" has been in evidence for roughly 130,000 years ago. In some places, Neanderthals co-existed with modern humans for about 10,000 years, and it is possible (although much debated) that the two species may have interbred. Recent mitochondrial DNA studies at the site of Feldhofer Cave suggest that Neanderthals and Humans had a common ancestor about 550,000 years ago, but are not otherwise related; nuclear DNA on a bone from Vindija Cave supports this supposition although the time depth is still in question. However, the Neanderthal Genome Project appears to have settled the issue, by uncovering evidence that some modern humans hold a tiny percentage (1-4%) of Neanderthal genes. There have been several hundred examples of Neanderthals recovered from sites all over Europe and western Asia. Considerable debate over the humanity of Neanderthals--whether they purposefully interred people, whether they had complex thought, whether they spoke a language, whether they made sophisticated tools--continues. The first discovery of Neanderthals was in the mid-19th century at a site in the Neander valley of Germany; Neanderthal means 'Neander valley" in German. Their earliest ancestors, called archaic Homo sapiens, evolved, like all hominids did, in Africa, and migrated outwards into Europe and Asia. There they lived following a combined scavenger and hunter-gatherer lifeways until about 30,000 years ago, when they disappeared. For the last 10,000 years of their existence, Neanderthals shared Europe with anatomically modern humans (abbreviated as AMH, and formerly known as Cro-Magnons), and, apparently, the two types of humans led fairly similar lifestyles. Why AMH survived while Neanderthals did not is probably among the most-discussed issues concerning Neanderthals: reasons range from the Neanderthal's comparatively limited use of long-distance resources to out and out genocide by Homo sap. Alternate Names and Spellings: Neandertal, Neanderthaloid. Some scholars use Homo sapiens neanderthalensis or Homo neanderthalensis. Range: Skeletal material and lithic artifacts thought to represent the evidence of Neanderthals have been found throughout Europe and western Asia. The Neanderthals were the first human species to live outside of the temperate zone of the world, at sites such as Weasel Cave, Russia. Hunting Strategies. The very oldest Neanderthals were likely scavengers, who recovered food from other hunting animals. However, by the late Middle Paleolithic, Neanderthals are thought to have become adept using a spear in close-quarters hunting strategies. Stone Tools: The group of tools associated with the Neanderthals in the Middle Paleolithic (before about 40,000 years ago) is called by archaeologists the Mousterian lithic tradition, which includes a tool making technique called Levallois; later they are associated with the Chatelperronian lithic tradition. Tool Types: Types of tools associated with Middle Paleolithic Neanderthals include all-purpose scrapers and tools made from stone flakes. The shift in tools that marks the transition from Middle to Upper Paleolithic is marked by increased complexity—that is, tools were created for specific tasks rather than all-purpose—and the addition of bone and antler as raw material. Mousterian tools were used both by early modern humans, and Neanderthals. Use of Fire: Neanderthals did have some control of fire. Burials and Ceremony: Some evidence of intentional burial, perhaps some grave goods, but this is rare and controversial as yet. Some evidence that babies and infants were buried in shallow pits, and others in natural fissures as well as shallow excavated graves. Possible grave goods include bone fragments and stone tools, but these are again somewhat controversial. Social Strategies: Neanderthals apparently lived in small nuclear families. There is clear evidence for some amount of social networking, including interaction between family or neighboring groups. Language: It is not known whether Neanderthals had a language. They had a big enough brain and they apparently had the vocal equipment, so it is quite possible. Physical Traits: Neanderthals walked upright, and had hands, feet and body forms similar to early modern humans (EMH). They had a big brain like we do. Based on the bone structure, they had powerfully built arms, legs and torso; and powerful teeth and jaws. This last characteristic combined with exhibited tooth wear suggests to archaeologists that they used their teeth as tools for holding and stripping things more than EMH. Appearance: Endless discussion about how the Neanderthals looked, whether they looked more like gorillas or more like early modern humans, has occurred, mostly in the public press. Jim Foley of the Talk Origins website has a fascinating collection of images used in the past. Art: Marks on animal bones are known to have been created by Neanderthals. A recent find in France appears to be a purposefully chipped face. DNA: Neanderthal DNA has been recovered from individual skeletons at a few sites, including Feldhofer Cave in Germany, Mezmaiskaya Cave in Russia, and Vindija Cave, Croatia. The DNA sequences are similar and divergent enough from EMH to suggest that Modern humans and Neanderthals are not closely related. However, some controversy has arisen over the characterization of the Mezmaiskaya infant as Neanderthal; and geneticists are not united in believing that no gene flow occurred between Neanderthals and EMH. Most recently, DNA studies suggest that Neanderthals and EMH were not related, but had a common ancestor about 550,000 years ago. ​Krapina, Croatia. Bones from several dozen individual Neanderthals were recovered at the 130,000-year-old Krapina site. Weasel Cave, Russia, with several Neanderthal occupations between 125,000-38,000 years ago. Cold climate adaptations. La Ferassie, France. At 72,000 years old, La Ferassie includes one of the oldest and most complete Neanderthal skeletons recovered to date. Shanidar Cave, Iraq, 60,000 years old. A burial at Shanidar cave contains an abundance of several types of flower pollen, interpreted by some to mean that flowers were placed in the grave. La Chapelle aux Saintes. France, 52,000 years old. This single burial includes an adult man who experienced tooth loss and survived. Feldhofer Cave, Germany, 50,000 years ago. This site, located in the Neander valley of Germany, was the first recognized discovery of Neanderthals, 1856, by schoolteacher Johann Carl Fuhlrott. It is also the first site to produce Neanderthal DNA. Ortvale Klde, Georgia, 50,000-36,000 years ago. 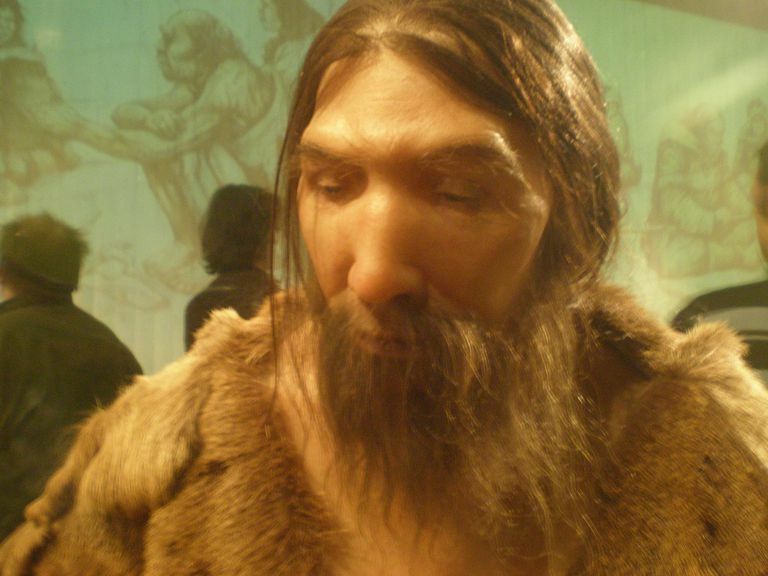 The Neanderthal, from the BBC's Channel 4 program. The Neanderthal Demise, Michele Miller in the Athena Review. 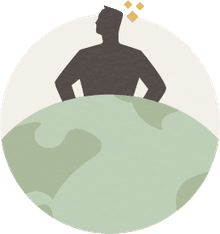 Neanderthals and Modern Humans in Western Asia, this website features a lengthy discussion on the modern human/neanderthal connections. What do you think would have happened to the Neanderthals if Modern humans hadn't entered the scene? What would a Neanderthal world look like? What would today's culture be like if the Neanderthals hadn't died out? What would it be like if there were two species of human on the world? If both Neanderthals and Modern humans could talk, what do you think their conversations would be about? What might the discovery of flower pollen in a grave suggest about the social behaviors of Neanderthals? What does the discovery of elderly Neanderthals who had lived beyond the age of fending for themselves suggest?